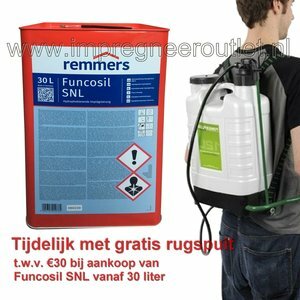 Promotion: Funcosil SNL in 30 liter cans are temporarily supplied with a low pressure backpack sprayer. 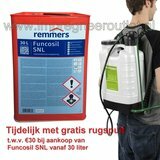 With purchase of at least 30 liter Funcosil SNL a backpack sprayer will be included in our shipment. After thorough cleaning and flushing, this sprayer can also be used for other applications or for renewed use in applying impregnates. 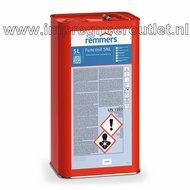 The backpack sprayer can also be exchanged against a discount voucher upon indicating so in the comments field in the order form. Proven effect Funcosil SNL: >10 year. For hydrophobizing impregnation of porous, cementitious building materials such as brick and clinker masonry work, fair-faced sand-lime brick masonry work, cementitious renders, fibrated cement, aerated concrete, light-weight concrete and modular concrete blocks, natural stone. 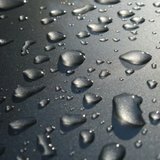 Can also be used on surfaces already hydrophobized. 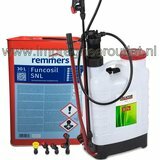 The Funcosil SNL is applied under gravity in a flow coating procedure generously enough that a 30-50 cm long film of liquid runs down the building material. The nozzle should be held horizontally and led along the facade without interruption. After the Funcosil SNL has been absorbed, the process is repeated several times. Spraying pressure and nozzle diameter should be selected so that misting does not occur. To avoid missing areas, limited sections should be completely impregnated without interruption. A brush or roller can be used for smaller, complicated surfaces that do not allow a spray application. In this case, the required application rate can only be achieved by working with well saturated tools. Protect the freshly impregnated surface from driving rain for at least 5 hours. Strong wind and sunlight may accelerate evaporation of the carrier which has a negative influence on penetration depth. The surface of less absorbent substrates should be washed off with V 101 Thinner half an hour to an hour after application to remove excess material which could create a gloss. 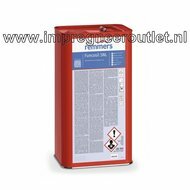 Working temperature: Water repelling impregnation is preferably carried out at temperatures between +10 °C and +25 °C. Sun awnings can be used to prevent surfaces from heating too strongly. At temperatures below 10 °C, evaporation of the carrier and formation of the active ingredient may be considerably delayed. 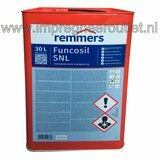 New packaging: Funcosil SNL is now packed in red painted containers; the same quality, a brand new look.